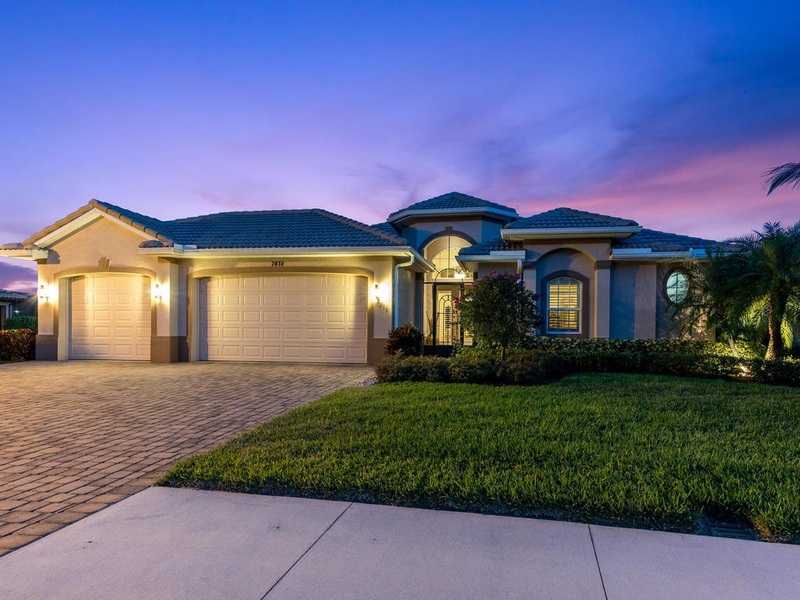 A perfectly designed CUSTOM BUILT home by the highly respected local NAPLES builder of GULFSTREAM HOMES, and inspired by the preferred Sarasota model by Stock Construction. It has an exceptional open floor plan allowing for optimal indoor/outdoor living. It features three bedrooms, and two and a half baths, PLUS home office, PLUS THREE CAR garage, with a SOUTHERN exposure OVERSIZE LAKE FRONT LOT, vaulted ceilings, and IMPACT WINDOWS & storm protection throughout. The pocket doors will open seamlessly to the EXPANSIVE SCREENED LANAI, and a HEATED POOL and SPA. This professionally built and designed HOME OFFICE ALSO has the same beautiful southern exposure views! It is situated on an oversize lot with outdoor landscape lighting accentuating the beauty its nighttime curb appeal. This home has been IMMACULATELY CARED FOR and well maintained by the current owners who took joy in building this home and also features a BUYERS HOME WARRANTY by American Home Shield for one year. HI-SPEED XFINITY CABLE & INTERNET (Up To 100Mbps Speeds!) INCLUDED in Low HOA Fees! |This home will ALSO be sold FURNISHED/turnkey at no additional charge as a convenience to a potential Buyer.